28% of adults want celebrities to speak up on political issues, using every platform available, while 29% say celebrities should stay out of politics. 25% say celebrity opinions would influence their midterm vote, a number that jumps to 36% among Gen Z adults. Entertainers should stick to the red carpet and stray from cheering on candidates on the campaign trail if they want to avoid antagonizing a significant chunk of their fans, according to the first Hollywood Reporter/Morning Consult poll. 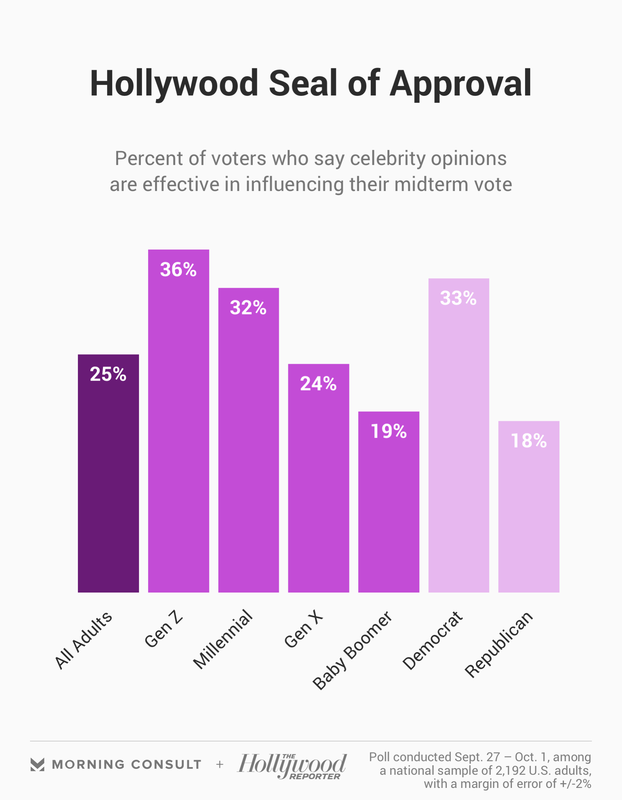 But the public is open to celebrity commentary on more cultural issues, and one-quarter of adults said stars’ opinions would impact their vote in the 2018 midterm elections. The survey, conducted Sept. 27-Oct. 1 among 2,192 U.S. adults, came just days before singer Taylor Swift broke her political silence and endorsed Democratic midterm candidates in Tennessee, criticizing Rep. Marsha Blackburn (R). Twenty-eight percent said celebrities should take advantage of every opportunity, from red carpets to Twitter feeds, to discuss political and social issues that matter to them, while a nearly equal number (29 percent) said celebrities should not publicly express their opinions at all. 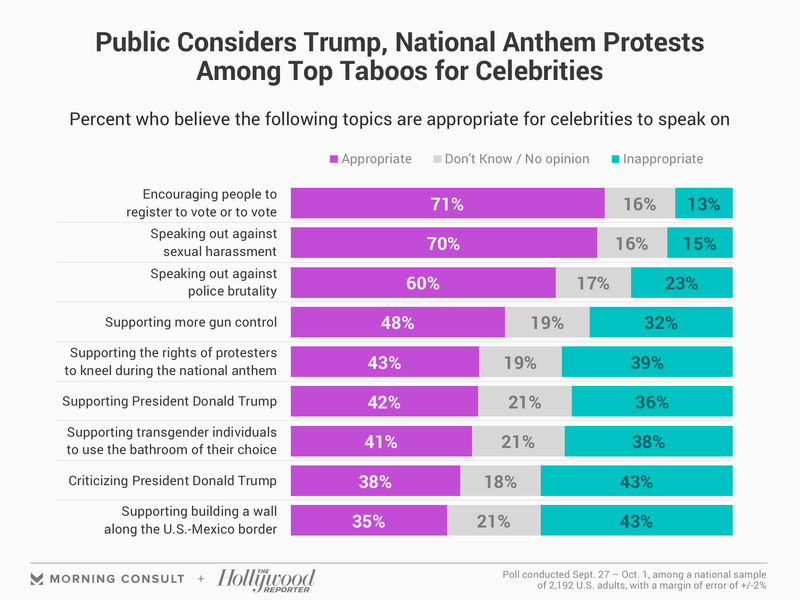 Specifically, 38 percent and 39 percent of U.S. adults respectively would be turned off by celebrities opining on protests during the national anthem and transgender bathroom policies, versus 41 percent and 43 percent who said the topics were appropriate. These two issues, along with criticizing or supporting the president and campaigning for Democratic or Republican candidates, were among the most divisive issues surveyed. Supporting the construction of a wall along the U.S.-Mexico border was the most divisive topic. Public attitudes on celebrities mirror how people view political talk from brands. According to Morning Consult’s “CSR and Political Activism in the Trump Era” report, supporting those who kneel during the national anthem is one of the most controversial topics a brand can take: One-third of adults in a survey said they would have a more favorable view of a company with that stance, while 38 percent said their views of the firm would dim. Among the safest topics for celebrities are encouraging people to vote and speaking out against sexual harassment. In general, celebrities would do well to keep their comments more general, rather than advocating for specific policies or movements. Respondents were more willing to hear celebrities’ support of the Second Amendment (57 percent say it is appropriate versus 20 percent who say the opposite) than their support of more gun control (48 percent appropriate, 32 percent inappropriate). Likewise, adults are more willing to hear attitudes on “civil rights” (68 percent appropriate versus 14 percent inappropriate) than on the more specific “Black Lives Matters” movement (50 percent appropriate, 30 percent inappropriate). With midterm elections less than a month away, stars’ advocacy on hot-button issues could shape outcomes at the ballot box, with some celebrities weighing in on high-profile races. Actress and comedian Amy Schumer, for example, has been an advocate for stricter gun control, while actress Alyssa Milano has been an important voice within the #MeToo movement. And Texas Senate candidate Rep. Beto O’Rourke (D) has earned praise from celebrities such as athlete LeBron James for his stance on kneeling during the national anthem. A quarter of adults, including 36 percent of Gen Z adults and 33 percent of Democrats, said celebrity opinions on political and social issues are effective in influencing their midterm vote. Republicans may be less likely to say they’re influenced because of Hollywood’s perception as a liberal bubble.